Happy September! I was first! First up, (and as usual the first of every month), I posted Stan's most excellent column, here. Please feel free to click here to access and bookmark it! I woke, today, finally bolting out of denial. For some reason, I had high hopes for long mornings sipping coffee, with nothing much to do. That wasn't to be, and reality is catching up with me. I spent my time catching up, and now it's time to face reality. I have surgery on Thursday to try to fix my eye. I'm so stressed about this that I had just totally blocked it from my mind. And oh! Did I mention? I not only get one eye surgery, but two! Double your pleasure! Double your fun! Sign up for two eye surgeries, instead of just one! Ya think they'll wax my legs for me, while I'm out? I'd love that. It hurts! Yeah... I have some problems with my last surgery in my right eye. The stitches didn't heal, (what's new) and now I have a bleb on my eye. That's like a blister. Too funny. My eye really hurt one day, and I had David look at it for me. "Ewe!" He said. "It's a blister!" Later, after talking to the doc, David said, "So what did the doctor say?" "Well, David," I started... "He said that it's not good, and I need you to take a razor blade and pop it for me." The look of horror on his face was unforgettable! I laughed till I cried. Poor kid! Mean Mom! I did tell him I was joking. Then, if that all goes well, I get to go to a hotel and sleep it off, go to the doc the next morning, and then come home! Weeks and weeks of wearing an eye shield will follow. Then, when I'm all well and you guys are all salmon fishing, I'll go do the right eye! This time, it won't be so special. Just a sclera patch over a hole in my eye. I don't much care for holes in my eyes, so it will be nice to have it all patched up. You know, this is a good lesson, also. One year I didn't have the money, really to update my wardrobe, so I took my old Coach purse, and had it redone, restitched and cleaned up. It was good as new, so girls? No need to ever get a whole new eye. Just get yours patched! OK... I'm sick of surgeries. I really am. But, you know what? Thank GOD that they keep fixing me! That's all I can say! Thank GOD! Yes, at this point in my life I feel like I can be sarcastic, and just giggle along with it all. It is what it is, and I have to do it. I'm glad that I have the choice, the chance, and yes, the cheer!! As long as they can patch me up like Ms. Dumpty, I'm good to go! I'll be fishing again in no time! You watch! Now, skee-dattle on over and read Stan's column. It's much more entertaining! For now, I'm going to go float around in the canoe. My free "sighted" days are coming to a halt for a bit! Photo Courtesy of "Passing Thyme"
Hoquarton or Dougherty Slough-- not sure. Slicing smoothly through the water in our kayaks, it was difficult to believe that we were just yards from Hiway 101, downtown Tillamook. We paddled through the thick rain forest, and only when we went under the 101 bridge, did we hear the business of traffic from town. We cut through the brackish water without any additional sound, and barely a wake or trace. The water was dark and glassy and still, seemingly without current- although we knew better. When we stopped paddling for a quick lunch of home canned tuna salad, we floated backwards, as the strong pull of tide tried to carry us and everything else, out to sea. Deep rust colored and golden-yellow maple leaves festively spun by us in circles. The conifer trees stood tall and still. Big old Spruce trees, tilted away from the sea as if their hands were on their hips, finger pointed, saying to the tide, "You can take thesssse sisters, but you won't take me!" They dug their roots in, firm. The winds of a thousand storms had tilted them back in that sassy pose. But a few of the huge monsters had given up the fight, and had come to their final resting spot against the shore. They had finally let loose their ties to the earth below during the last winter's storm. Kim casually pointed them out to me as we sailed by. Imagine that. A towering tree, thousands of years old, laying helpless in the mud while a tiny soft moss tended to their death, attempting to bury them in a lush and beautiful grave. Someday they will break down, give back to the nutrients of the earth, and the cycle will happen again. Perhaps next year? A tiny Spruce tree? A foot tall? A bird will plant it, a salmon carcass will feed it. Well, although my soul is still and peaceful, my shoulders sure aren't!! Wowza. Kayaking is not for wimps! I'm a wimp! I can't believe how strong Kim is from doing this on a regular basis. She was kind enough to pull my entire kayak up on the mud when we got home, so that I could... roll out! And I did! I nearly had to roll! My legs were cramped up, seemingly refusing to budge! Still, a grin was permafixed on my face. It was a great trip! As we traversed the quiet channels, she called out the names of birds, of flotsam and jetsam and by the time the trip was over, I had a brain full of biology and entomology and aviology! The girl knows her rain forest stuff! Not only that, but "here and there, and that place over there by the brush-- that's a great salmon holding spot!" Now I know! We noted how different the landscape is, only miles apart, here on the coast. How amazing it is that where I live on the Kilchis, it is green and lush and usually windless. In downtown Tillamook it is windy and cold. In the thick of the rain forest on the slough, it is muggy and warm, moldy and thick smelling. Yet it is so alive! The animals and birds have their own private sanctuary back there, and it was lovely that they allowed us the visit. I'm refreshed. I'm ready for my surgery, now. Thanks to Kim, that is. I took a whole day and escaped everything to go. We built a picnic and shoved off... away from reality! We let our souls sail the river and our spirits soar to the tops of the trees. We were quiet, lifted from the spooky 'no of all nothing' that lives in the rain forest behind Tillamook. "We need to be able to see, feel, taste, hear, and smell the magnificence around us, lifted from "the no of all nothing," as e.e. cummings puts it! And we were lifted! Wow! It's just a different world, back there! It calls me. If I had the money, I'd certainly buy this place! What a Disneyland! As we giggled, floating free back with the current, she said, "Isn't this like a carnival ride?" I told her that the song, "It's a small world after all!" kept going through my mind. Indeed! We only had to dip our paddles to keep us on a straight course. Kim's site is here. I'm not thinking that she is still renting kayaks. She owned the two that we used, yesterday as her personal kayaks. But the pictures give you an idea of where we've been and what we saw. I hope you enjoy! I'm out for surgery until this weekend. Of course, depending on if I can see. I keep shutting my one eye to see what it will be like. The eye to get worked on is already 20/400, I think-- but at least I see light and shapes that help balance my sight. Without that, it will be much different. Of course, there is the chance it will see really well. What an exciting thought! I just keep repeating my favorite bible verse. "Do not be anxious about anything, but in everything, by prayer and petition, with thanksgiving, present your requests to God." Of course, I also remember my Mom's favorite, as she was going through her cancer treatments. "God will take care of me." I love that! How simple! It makes me smile, even as I type. I'll be in surgery at 8:30. The good Dr. Mathers, with a nickname of "the sewing machine" will do well. I know he will, because I am praying for him! Recovery will be welcome. I'm going to sit on the porch in the late Fall sunshine, admire the colors of Fall with my new eyesight. I'm so excited for it to work, because I'll get a new lens, and new lenses are like shiny new baby lenses, without a scratch! Vibrant colors, here I come! I just keep thinking about when I first had eye surgery, and my eyesight was incredibly clear! It went from blind to 20/40. I was madly cleaning my house and my sister said, "So, getting your house up to 20/40?" LOL...Down on my knees, studying the grooves and texture of the carpet, my wall paper... Everything had texture that I'd never seen! And oh! the fake diamonds on a Barbie doll at Costco took my breath away! OK! I'm excited now! Maybe now I'll be able to see my line coming from my fishing rod, and salmon in the water and rabbits that Bill sees on the side of the field, and plants that Kim pointed out on the side of the slough! Maybe? Maybe! OK, off I go. Bill's driving me in. He's a Saint! "All I want is a room somewhere, far away from the cold night air. I am back home and headed to rest. I have no vision in my left eye (surgery eye) at this time, but the doctor says this might change. That the lens is in the right place, but my pressure is very low, and the 20/400 that I am testing at may be a result of swelling. I sure hope so. I'm a bit worried and pretty down about it. Pray for change! I am! It sure itches. It's worse vision by a bit, than what I had before, so it's hard for me to see to type unless I close that eye. Rest. I must rest. With rest might come better vision? I hope so! Very fatigued, though. Off I go. It sure is an unusual day! It's like The Dalles, here. A light, powdery blue expanse of sky, a strong wind, but a warm heat that beats down on everything. It dries a hanging basket out, faster than you can blink. I put on my shortest shorts and my strappiest summer top and headed out to the river. I do so, ever so slowly. I can't see well, but man, does it feel good outside! Nothing like a hot wind, blowing on bare skin and in contrast, a toe dipped into the cool, Kilchis river. There's lots to enjoy in life, besides sight. I've eaten four kinds of berries, fresh off the vine, for breakfast. Blue, Black, straw and rasp! There is a snake that lives under a log where I sit on the river. Every day before I sit down, I have to tap on it, to tell the snake to move. It's big, and has a yellow stripe down it's back. We fight over the same log to rest by. When I tap, he swirls out of there so fast, that I can barely track him. I can't track him at all today, but I heard him move! I didn't know how much my left eye helped my vision, until it was all the way gone. There is a big difference between 20/200 and 20/400! I really have to be careful, walking. I don't think I dare drive, unless it improves. Other people do, though, with one eye. I may have to just learn how they do it. I am legal to drive, with one eye at 20/40-50ish. I'm just praying and praying hard that it improves! It has to! I really want to be able to tie a knot again! If it doesn't, it doesn't, and I'll learn to live with someone helping me. That's not all bad, and at least I have lots of folks to help me! Of all things, Bill decided to "vacuum" out the fireplace, today, and the ash went everywhere! Not a good idea to vacuum it! LOL... I'm up to my ears in dust! So, it's cleaning by Braille for the kids and I, today. Ah, crud. I don't want to do that. I just want to play in the sun and rest. I think I will! After all, if I can't see the dirt, it must not be there. Right? As I make out a new page for my journal for September, I get to link up a new month, here on the archives. As I linked September, I thought how unimportant my eyesight really is. I am still here, and after my aortic dissection, well, I am just so thankful! My eyesight is wanted, but very insignificant in the whole picture. I keep an 8 foot Coleman canoe on the river beach, out in front of the house for when I want to paddle around. It's lovely, this time of year when the water is cool and clear and you can see, clear to the bottom of the deepest holes. I love it, so much! 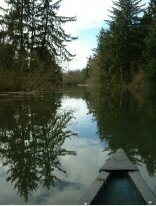 Yesterday, I went down to paddle, but it was too windy, so I took a seat in the canoe, and just sat to watch the dogs play. It was so hot that Rev dug a hole under the canoe, and used it for a cave. It made me giggle. It was so warm, yesterday! Warm, and windy, and odd. I left the canoe after a bit, and went up to take a short nap. Since my surgery, I've been tired. For some reason, when I can't see, when the world is a blur, it makes me sleepy. When I woke up, the wind had died, some, so I went back down to the river, with the dogs. The canoe! It was gone! It had been wedged up high in the sand, safe from people who might want to take it. It's pretty heavy for me, but the boys and Bill help me haul it up the bank. The trails of where someone had slid it into the water, along with their footprints were clearly cut into the sand. I quickly walked back to the house. "Bill! The canoe! The canoe is gone!" Bill dropped what he was doing in the kitchen, and headed for the truck. First stop would be the park, up above. It had only been a couple hours since I had left the canoe in its place on the beach. Thinking by any odd chance that the canoe had been blown off the beach and sunk, I head back out to the river. I squinted, trying to see into the sun lit river. Bill stopped on the road and yelled down to me. "Any sign of it?" I shook my head and he revved the truck up, and headed to the 101 bridge. Giving up, I walked back to the house, disgusted. I loved that canoe! Who would just take it? Of all the nerve! Soon enough, the phone rang. "I got him! Sort of!" Bill panted. When he turned the corner, he stopped his truck on the bridge. From this viewpoint, he peered upstream and sure enough! There was a man with long hair and a beard, with our canoe by his side, standing in the chum shallows! Bill quickly pulled his truck around to the boat launch, grabbed his pistol, and shot a warning shot into the air, while yelling at him. The man, nearly 200 yards upstream ran so fast, and in such fear, that Bill said he almost left his pants, behind! Caught! Red handed! The man dashed for the woods, and pretty soon Bill heard a car engine start. A blue and white truck, came speeding past Bill. Lucky for Bill, he got his license plate number, and it is a local resident, here in Tillamook. Of all the nerve! It just feels strange to have someone try to steal something from you. I'd never really had it happen, before, but it feels so invasive! That's MY canoe, buddy! Bill reported the theft to the police, complete with license plate number, model and make of the old truck the guy drove. Later, when we were in bed, the police called to come take a report. They had located the guy, I guess. I don't know what will happen, next, but Bill is mad enough about this to press charges, and you know? I don't blame him. You don't just take someone's property home with you. I'll never forget how it feels to have something like this stolen. Especially something that brings me such joy on the river. There are icky cigarette butts in the canoe that belong to this guy, I guess. I'm going to go clean it out and take it for a spin. Tee hee! I'm going fishing! Don't tell my doc! I'm promising that if I get a salmon on, I'll hand it off! I promise! I just want to get out there and feel the rush! I'm alive! I'm alive! - and OH what a beautiful morning! Yesterday Andrew, Bill and I went to OHSU and spent the entire day there! Sheesh! Pack a picnic! Roo had an appointment with Dr. Hwang at 9:40. He wasn't seen till noon!!!! Pheh! But, there is no way you could be upset. Dr. Hwang is so awesome. He makes you giggle how he runs from patient to patient, trying to help everyone. He's overbooked, yes, but that's because so many people need expert help, and there just aren't enough Portland docs to go around. They had to dilate Andrew FOUR times to get his eyes dilated enough to see what was going on. Sure enough, one stitch in his lens was loose. So, they are going to do the exact same surgery that I had 9 months ago on my right eye. If it doesn't go well, then they will take that lens out, and place a new one in, which is quite another matter. A more serious surgery. I guess it's all serious and scary, as it is presently his only functional eye. We talked a bit about doing his other eye, but he said, "One at a time, please." Andrew is finally ready to consider them doing his other eye. They are concerned, though, that since his brain has never seen out of that eye, it may be too much stimulation for his brain, and his brain will not know what to do with it. There is also the chance that his brain won't be able to learn how to use the two eyes together, and that he would see double. So, lots to pray about! Andrew has really grown up, though! The smell of the place didn't bother him, and he seems emotionally ready for this next challenge in his life. He said to me, though, "Everything bad is happening lately. My Mac book is broken and so is my eye!" Poor kid. I think he'd rather you pray for a new Mac laptop than his eye! My appointment was at 1:45, and I saw Dr. Mathers at 3:00. Those docs are SO busy! I am seeing better! Not great, and I still can't read, but occasionally the sight gets better. It goes in and out. What's going on is that there was bleeding in my eye, and it's got to reabsorb before I can see. The good Doc was so nice to me. Dr. Mathers held my hands together in a prayer like pose, and got up close and said to me, "Everything is going well!" I liked that. My stitches were really bothering me, and I told him so. He said that he could fix that by melting them. I said, "Need a Bic lighter?" That made him giggle. Anyhow, they got this torch thingy out and said I'd feel warmth. I'll TELL YA WARMTH! I don't know what happened, but they said it wouldn't hurt, but it HURT!!!!!!!! BIGTIME! So, he backed off and tried it again. YOWSA! I guess they burned my cornea with it. So, the fact is, after the burn stops hurting it will feel better! My poor eyes. They've been doctored to the point of a patchwork quilt. It's a wonder they see at all! So, that's the latest entry into "All of my eye surgeries..."
Pray for Roo on September 27th. That's the date of his next surgery. To my dear Mother, (God rest her soul)... I had no idea what you went through with us kids. No clue! To think you had five children, instead of just two! Oh my! My heart aches for what we must have put you through! I was not an easy child. Therefore, I can look back, and feel not so badly for the paces my kids are putting me through. It's payback time! There is joy, yes, but there is also heartbreak, worry, and so much more! What a trip! My sister reminded me that God gave us children so that we could relate to what it is like when we, as His children, hurt Him. Boy, oh boy, does that make me want to be a good daughter! Please don't get me wrong. I have been blessed with two absolutely adorable, wonderful soon-to-be men. As roommates, I couldn't ask for better. Well, maybe a bit better, but all in all, I am so lucky! They both have a tremendous sense of humor, and I am kept in stitches, most of the time. And I think of the other night, when they got together in the kitchen and created the most wonderful dinner for me. Thai chicken soup, and oh! Was it good! And then I have Andrew, the holder of the absolute truth. Andrew, do you love me? Yes, but your parenting skills leave alot to be desired, Mom. (Sometimes he doesn't even say it so nicely.) Right now he's reading a book that I tease him about by saying its title is, "How my parents messed up my life." I believe that he studies psychology for the explicit purpose of criticizing my every move as a parent. After all, he didn't choose to be born. Ask him! That was my first mistake, and if you ask him, they don't end there. Now, back to Saturday... David will not be moving into his dorm on Saturday. He "almost" finished all of his requirements. He "almost" got everything in on time, but not quite. I received a phone call yesterday from admissions that his admission has been put on hold. WHAT? Monday, I'll be driving to Portland to help him finish those requirements. You know, the ones that should have been finished in the last four years. I was a mess, when I found out. I couldn't talk. I was stifled by the news. I had been working to help him with the parenting end of this for months. You know, financial aid, packing, making sure he had a bank account that was accessible, all that stuff. And then? This? And what did 'David the glosser' have to say about that? "Oh, Mom... Can't we just be positive and move forward?" I'm not even going to ask Andrew what he thinks. I'm pretty sure he'd tell me it's my fault for having poor parenting skills, after all. To my Heavenly Father and my Dear Mother, who sits beside Him, there: Please forgive me!!! -and quit laughing. Oh, no! I forgot about "That's hot!" yesterday! Maybe that's cuz there isn't much that's hot, lately. Not until the rain comes, this week! I hope it's significant. That would be hot! Today if my eyes clear up, I'm going to try to drive to the Tillamook Angler's Disabled Kids Fishing Day. Jerry Dove says: "Saturday. September 15th is the 16th annual fishing day for kids with disabilities! We average 250 to 300 kids from all over Oregon and Washington. Everything is furnished, including food. We always need lots of volunteers to work with these kids. Coffee and sweets at 9 AM and fishing at 10 AM. Just show up and have a good time! Please spread the word to any one with disabled kids. Feel free to email me or call for more info. Tillamook Anglers office, 503-842-6519--Cell, 503-812-1572. So, I better get a move on, if I'm going to go and take some pictures! I can't help tie knots, but I can do other things! I adore this time of year. The rain is falling, and it brings back all sorts of memories. I lived on the South slope of Astoria on Pleasant Avenue for quite some time. My kids would be settled into their Fall school year at Robert Gray Elementary. After school, they had soccer practice and sometimes I'd skip out, and go to this hole that I discovered. It wasn't a pretty place to fish, but it was effective. If I had the proper gear, I'd be tempted to go there, this morning. We'd stop alongside the road. It was ditch fishing at it's finest. The pool would fill up at high tide, and then start back out again. We'd toss out our bobbers, and sure enough, the jacks would go crazy. You'd never heard two girls giggling so loudly in your life. "Fish on! Fish on, again!" I'd hurry to get my limit and then go pick up the kids. I'll never forget first discovering this place. I was just driving along, and as I usually do when I see water, I looked. A fish jumped! I slammed on my brakes and turned around. Jacks en masse! Everywhere! I raced home, grabbed my rod, and came home with a limit! Wheeeeeeee! In a ditch, of all things! Sometimes Ester couldn't go, and I'd sit alone alongside the hiway, fishing, alone. The high school track team might be on this route, and when they ran past, I was sure they thought I was crazy. I didn't really fit the term "Soccer Mom", as I arrived to pick up the kids. I was the only Mom that smelled like salad shrimp and dead fish. No preppy white tennis shoes for this girl! Despite the looks I received, I've always been proud of my fishing. I held my head high and offered the pretty Moms fish for dinner. Funny, though, I'll never forget the impatience from my kids when on the way to the grocer, I said, "Do you mind if we just drive out to the ditch for a minute? --and see if they are jumping yet?" Oh, the rolled eyes! Oh, the disgusted sighs! Looking back, though, I do wonder what people thought. I'll never forget going into Englund Marine and buying the longest net that I could purchase. This was for fishing the jetty, safely, when I was alone. I only had one girlfriend, the minister's wife, Carol, who was brave enough to dodge the huge waves of the ocean off the Hammond jetty. It was a sort of dance. I had to call out, "Wave coming in!" and she'd dance back up the rocks until the coast was clear. Then she'd dance back down and net my fish! When Carol wouldn't go, I'd try to get a fellow angler to net my fish. She accused me of trying to kill her! So, she got smart and didn't go with me, any more. After a while, though, I caught so many fish that the neighboring men got a little ticked, and turned their heads the other way, when I was bringing in a fish. Nothing like being out fished by the very woman you had helped to learn the ropes. I didn't blame them. The long net was not collapsible, so I had to carry a roll of duct tape and tape it to the side of my car, both before, and after fishing. What a hassle! But, well worth it, when it was needed. That net got a work out. When I moved to Tillamook, I no longer had a use for my dear net, and I donated it to the handicap ramp on the Nehalem. Jim Erickson was proud to take it down to them. It was perfect for their needs. I guess that it was eventually stolen, however. There is a soft place in my heart for that net. I wonder where it is, now. The rivers surrounding Tillamook will soon be full of salmon. But, it's a moons away... a totally different fishery, here. Somehow, despite the fact that I have my own personal professional fishing guide, (and no offense to Bill!) I still think I caught more fish when I was on my own in Astoria. I think I just wasn't so darn busy. Single parenting keeps you running, but I had time, when they were in school. Tillamook is the mecca for salmon fishing, for sure. The grass is just always greener, I suppose. I look fondly back to my time in Astoria. The jacks in the slow tide water. I had so many secret spots! The steelhead on the Lewis and Clark before they stopped planting it... the trout in "My Three Lakes"... (Sunset, Coffenbury and Cullaby). Fishing the Necanicum at the Relief Pitcher, and on the 12th Avenue bridge, and further downriver for flounder, too! My other constant fishing buddy, Ben Tagliovento taught me a ton! Long days on the Hammond or Warrenton jetties, or the sands of the Columbia, with tubes to place your rods as we ate sandy sandwiches in the truck. In the sunshine, the kids would play for hours, building whole cities in the sand. Sometimes the rain would fall so hard on those beaches! The winds would blow sideways so strong so that we couldn't tell if we had a fish on, in between the madly swiping windshield blades! Astoria calls me, sometimes. I suppose it's not the same as it once was. Ester now lives in Florida, and the kids no longer play soccer. Sigh. You can never go back, can you? But I can always close my eyes and go there. That way, it is forever and ever, exactly the same on Pleasant Avenue. I think I need to call Ben to see what's biting. Life is so full! Full to overflowing! Since my near brush with death, I feel things a bit deeper. As if that were possible! I've always been a bit emotional, but now? I'm a lost cause! A lady that I have written to that I met on the marfan list has passed away due to a dissection. That has thrown me for a bit of a loop. Last I had heard, Lisa was whispering to her husband, "Get me out of here!" (The hospital.) and that made me giggle for her. I know the feeling! And then, quick as a flash, she was gone. Her heart stopped and they were unable to get her revived. You have no idea how deeply that hits home for me. I think of myself, but mainly I think of Andrew and it scares me, very deeply. God Bless Lisa and hold her tight. How I wished I had just sent an e mail earlier telling her how much she meant to me. I suppose I'll get that chance in Heaven, someday. Until then, I sent the wishes and prayers to her husband, and family. I am beat! I spent a great couple of days with my dear son, David. He's so funny. My stomach just aches, after being with him. What a sense of humor! I nearly drove off the road a couple times, laughing so hard. My eyes welled up with tears. Man, he has a quick wit! He reminds me, sometimes, of Robin Williams. And smart? Man! No studying, whatsoever, and he passed these tests that challenged high school in the 95th percentile, Nationally. Wow! Here I was so worried, and come to find out, we had no reason. He told me not to worry. He said, "Mom, can't we just be positive, and look forward?" From the mouth of babes, we learn. I have to bow down to the folks at Clackamas Community College. They went out of their way to specially accommodate David. The folks at PSU seem a bit cold, and when I call them, I feel like they think of us as a number. I almost wish David were attending CCC. What nice folks! All of them! Thanks mostly, though, to Tarra! What a nice gal! David moves into his dorm at PSU on Thursday. I will miss him, so much! I just thank God that I still have Andrew at home. I think that if they both left at the same time, I wouldn't know what to do with myself! Andrew is a Mother's dream come true, too. Both my kids are so precious and such wonderful people. I am so lucky! I guess I've grown alot as a person. Just ask Roo. I have to giggle when he says to me how rotten of a parent I used to be. But, "You have grown so much." He says to me. I'm better now, he says. I'm much more tolerant and fair. Couldn't be that Andrew has grown, right? (LOL) You know, I think we both always grow... at least I hope, so! So, when they both are gone, I will miss them so much. But, I am also looking forward to new relationships with them both. A girlfriend wrote that she is excited about that, and that already, even after her son just moved out, they are having real conversations on the phone! That's just great! So much to be excited about. It is Fall, and with that, I am excited for the salmon season. I took the canoe out last night, and scoured the bottom of the river, hoping for a pioneering salmon, trying to make its way upriver. I found none, but one day I will! The river was still and shallow last night. I stopped my walk and gazed over at the late summer waters. In my mind, I could imagine that lone salmon, a shadow against the light, swimming upriver, searching for its mate. I feel so blessed to be able to wait for all of these things. The salmon coming home to my back yard, the boys, to go out in the world, searching for the way life will lead them. There is always something to look forward to. God bless each season in life, and thank you, Lord, for letting me be here on earth, to watch, to wait, to see. But, thank you most, Lord, for the anticipation and hope that you bless each one of us, with-- Both on earth, and the most exciting of all seasons, our time with you at home, in Heaven. Last night was David's Birthday. Today is David's moving day. The river sure reflects the anticipation of change. As I sat in my old lawn chair listening to Kilchis dig a tunnel towards me, I stared out at the open waters. The river was mostly still. A ripple of soft wind on the surface would come and go. When the wind cleared, I could see all the way across the bottom of the river. It was made up of curves and turns of softly molded rock underwater, where fish will hold, once the river runs at a winter's pace. Soon, salmon will fill those holds! The water will scrub that summer fuzz and softness off the rocks, and open up brightly multi-colored gravel for the salmon to spawn in. Now, everything is a dull brown. But the water will run faster and deeper, so that I can't see the activity, nearly so well. But, that's half the fun! I will search those crevices that I've learned from staring into the low water with a hook, instead of with my eyes. I will feel the bottom with a tick, tick, tick of my weight, and then feel it drop into one of those holding places. And then...then I will wait, heart pounding in anticipation for that long, heavy pull. Set the hook! I often marvel at how much the river reflects my emotions. I went to the river, after shopping for cards in the lonely isles of Fred Meyers. They've expanded Freddies in Tillamook, and somehow I got there at a slow time, right before dinner. No one was around, but me, and as I read the sappy Hallmark words that a Mother feels for her child, tears fell. Right there in the store! Last time this happened, was when Andrew left home. I am so proud of my boys, and I will miss David, so much! I don't think I've hugged him harder, or felt closer to him, than I have this last past week. There is reason for everything, and a season for all things. I have been through so many frustrating times with him, and yet coming through those times has left me much closer to him than I could ever have imagined. So, as I sat, kicking sand on the river, counting the minutes before the salmon come to visit. I likewise counted the minutes until the time today, that I hug him goodbye. Oh, the exciting adventures that await him! And as I was lost in thought, sadness overtook me... The whole stillness of the river... the wind had ceased, and everything just looked so still, and lonely... I felt those sup sup tears coming on, again, and just as I was going to give into them, my chair abruptly fell to the right, just missing Kilchis.. and I fell head first into the sand! KILCHIS! I had to laugh! Kilchis had dug a tunnel all the way to my chair, and under the legs, causing me to go tumbling into his death trap in the sand! I looked up at him and I swear he was laughing. I rose, laughing, shook the sand off my clothes, and headed up to the house for our Birthday dinner. Dang, I'm going to miss David. But, he can come home on weekends, right? Besides, I'll be busy catching those large silver salmonids, and the river will be high, rushing and happy.... matching my mood, again, I hope. Cold cereal is a life element. There is something so important about cold cereal that not all people realize. Some people I meet have no relationship with cold cereal. Bill is one of them. He doesn't eat cereal. I can't relate. My family is not like that. We love our cereal. I was raised to eat cereal. When I was little, cold cereal was the thing. Cold cereal, and hot buttered toast. My Mom wouldn't buy the cool stuff. You know, the sugary stuff, but we learned quickly enough that if you put enough sugar on your cereal, it tastes about the same as the ones that have the fun commercials. Once in a blue moon, she'd buy Trix, or something semi fun and the excitement over that box would flow through the household. We'd read every sentence on that box, as we sat, hovered over a bowl of it at the kitchen table. Sometimes when we went camping, or on vacation, we'd buy those long boxes of little mini cereals. Oh, what a treat that was to behold! And oh, the fights! Five kids fighting over the sugariest of treats! It was against our family law to dig through the cereal for the little plastic prize, so whoever was luckiest when pouring their cereal, owned it. Of course, when I raised my family, I rebelled against that law, and we dug into that box like crazy! It felt good to defy my parents! When I first got married, I think I half fell in love with my husband because of cereal. He told me that one thing that was important to him was that he always wanted a full cupboard and a good variety of cereal in his cupboards. Oh! I adore that in a man! Yes! Bingo! Do they ask about cereal on places like Match.com? I wonder! We all still love Capt'n Crunch when we feel decadent or for healing a wounded heart. Andrew has a thing for Cocoa Pebbles. I could never do that one. Chocolate cereal? No, thanks! We've been through the age of Crispix. We have graduated passed the timeline of Raisin Bran Crunch. Sometimes we revisit old favorites, but our personal cereal histories are all varied and individual. Oh! Have you tried Honey bunches of Oats with peaches? The peach flavor is intense! Yum. Anyhow, the truth is, David was aptly named "DeeDee-cakes" as a little one, because he adored pancakes. He was most often seen with the plate up to his face, licking off the last of the maple syrup. I don't know how many times I had to bathe him after breakfast, due to the strands of sugar coated hair that framed his darling little mug. But that little David... he grew and he grew and he grew... until he soared passed the sugary stuff and onto what my Father adores! Wheaties! Thank God they still make Wheaties! Their display is cleverly hidden amongst the more popular, and commercialized stuff, but they are still on the shelf! Cereal is home life. Cereal is history. Cereal is near and dear to my heart. It's nostalgic. Mornings of every season; before school, after school, buses honking, and cereal bowls in the sink left unwashed... late night snacks together, in front of the T. V. It's family food. Cereal history runs deep and rich and intense in our family, forever. But I stopped short. There on the shelf, hidden between two boxes was a single sloppily torn open box of Wheaties, with the waxed paper half closed inside, the way only David would put away his cereal. Last night I drove David to the city and helped him move the last of his boxes, his computer, his television and several bags of clothes into his dorm room at Portland State University. After, amongst the heavy traffic of students going here and there, I asked permission to hug him. I didn't want to embarrass him. He said, "Of course, Mom!" And I wrapped my arms around that big young man and let go with a smile. I was so excited for him! Then I left, feeling a rush of freedom. But this morning, as I stared up into our fully stocked cereal cupboard, there on the shelf was a Wheaties box that stood out amongst the others. I held it in my arms, close. The tears poured out of my eyes strong and steady, and would not stop. I uncrumpled the paper, and rolled it down neatly and tight, trying to avoid the massive flood of tears spilling onto the flakes. I put a chip-clip on it and closed it up tight, so that it will stay fresh until he comes home to visit. Thank God I have Andrew still home... at least for one more term. When they are both gone, I'm sure going to have a lot of cereal left over in this empty nest to cry about. I doubt if I'll ever be able to walk down the cereal isle at the store, either. To heck with this granola, stuff. I need some Cap'n Crunch. I still wonder about my friend Gary Winters and his daughter, Michelle. If anyone knows where Gary is, please let me know. Not only do I have some things of his, but I'd love to see his smile, again. I stopped on the river beach and listened for a minute. It was just wild. So quiet! So extremely quiet! It is so odd after a summer filled with bird songs of every type. Every time there are these quiet Fall days, it takes me back to 911. I'll never forget, in all my days, having watched too much of it on television, and having had enough of the terror. I tried to escape the evil by going out to pick blackberries. It was a day, exactly as I describe, here. Quiet, lonely, barely a breath of wind as I stood, shaken, on the warm, white rocks of the Kilchis river. So eery! It is this very lonely backdrop that is what make my hilarious bird so funny. There is a dipper that sings this absolutely joyful song that goes on and on. It makes me giggle every time I hear it and this bird either comes out in the Fall, or that is the only time I notice it. There is nothing else to hear! Trills and spills and non stop scales, up and down and all around- and there is no backup symphony. Behind the song it sings, there is a quiet nothing. I think that this is part of what makes salmon fishing such a rush! Out of the extreme quiet, -Out of the windless sky and the long days of Indian summer... Deep in a glassy pool that reflects the million colors, the Fall riot of orange and red leaves above, lives a salmon that has made it up the river, this far. Life! As strange as it seems! There is life! -deep, deep in the cool water! I see it all and hear it all, every day when I take the canoe out to cruise around in the late afternoon. The dogs make me laugh. They swim along side me as I search the bottom of the deep holes. Our river cat, Molly, cries a solemn tune, thinking we are leaving her. The darn thing actually swims out a ways to come get us! All of the sudden, out of nowhere, the bobber goes down. The fight is on and all you hear is the war cry of the angler, and the splash of a 40 pound monster slamming against the mirrored waters! The waves ripple from shore to shore and it is a one man act, all alone, with no background noise! That's what happened to me, this weekend and what a rush! 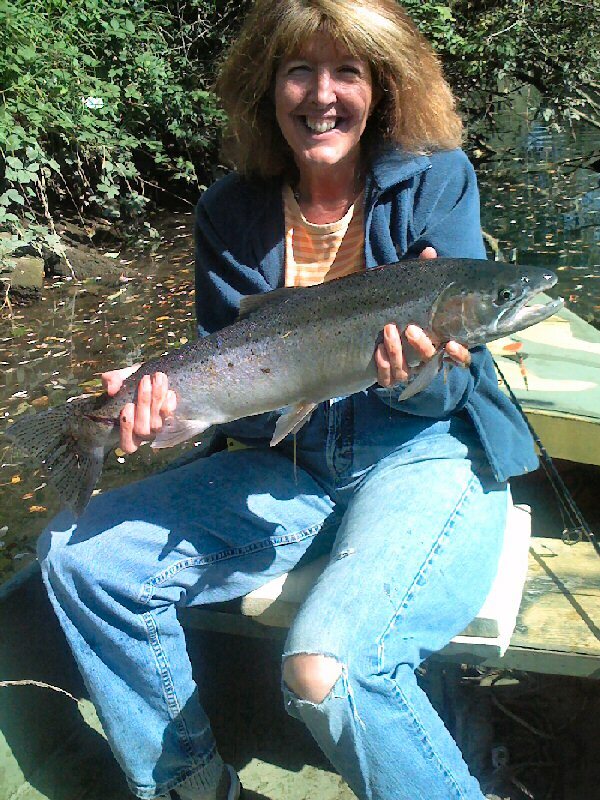 Even though it was only a six pound summer steelhead, it was still a rush! Excitement broke the otherwise stillness of tidewater. I had Bill take a picture of me. I was fishing for trout, and accidentally hooked into dinner! Before the sun came up that day, Bill and I sat at the kitchen table, yawning away the sleepies, over a fresh cup of coffee. What should we do, today? Did we want to battle the weekend crowds? Or shall we go to Nehalem? Would it be less crowded? Would there be fish there? Do we want to fly fish for cutts, instead? Or fly fish for summer steelhead? Or do jigs on the Wilson for summers? Is it a good day to 'fish' for chanterelles, instead??? We just couldn't decide. Part of me just wanted to hang out, water plants, fertilize my flowers, eat berries, and lounge in the early Fall sunshine. It was that kind of day... lazy, warm, with a nice breeze. - and oh so quiet. But, the breeze that particular day kind of settled it for us. We didn't want to go out in the open bay in that kind of wind. What is a nice breeze where we live, is often a fierce wind on the bay. So... we did one thing we just love to do this time of year. Put the duck boat in one of our hidey spots in tide water and take off in the channels, not knowing where we were going, or where we would end up. Winding around turns, and watching for logs and fishing for whatever, in between! Plus, besides just fishing, this time of year you might even gaze down to the bottom and see a salmon. That's my favorite thing to do! I've seen huge monster salmon go right under the boat, in three feet of clear water! Well, we were trolling and all of the sudden, my rod went down! "BILL it's BIG! I don't know what it is, but it's BIG!" You know, Bill gets used to me getting so excited, and he probably thought I had a log, or a big cutt or something. But, really, I knew it was BIG for six pound test! All the sudden, he said, "It's a salmon!" Then he saw the white mouth and corrected himself. "It's a summer steelhead!" "DINNER!" I screamed as I tried to keep the darn thing under control, setting my drag looser and looser... We had no net! Nuttin, honey! It was awesome, because we didn't really care if we actually kept and killed it or not. If we lost it, it was meant to be. If we kept it, we had dinner plans! So, I played it and played it and pretty soon, Bill just scooped it in the boat! LOL... It was hilarious! We bonked it with the coffee thermos! In addition, as the tide started out, the cutthroat fishing got really good. Bill hooked some really fat ones and they did some fine acrobatics for us! I caught a couple, too! What a great day. You can fill your calendar, here in the Pac Northwest, with lovely things to do in the Fall. Today I have to go to Portland for two eye appointments. One, to see if I can be fit for glasses on my new surgery eye, and two, to see if the other eye needs surgery on the bleb. I don't want another eye surgery. Man, it's like just lining them up. Andrew has surgery on his eye next week, due to a stitch that came out of his lens. Then, me, next? Again? Nooooooo! I have to salmon fish, Mr. Doctor! Please? So far, just one thing... The Guide Shop Fundraiser, October 20th, at the Elks. Read about it, here. It will also be posted at the top of ifish under "what's hot!" Remember, please, when you upload a picture on ifish to make it no larger than 600 pixels across. That's a rule on most bulletin boards so that it doesn't break the design of the forum software. Thanks! I'll be back with more in a bit-- I have to take a shower! Now... that's going to be hot! I'm freezing!